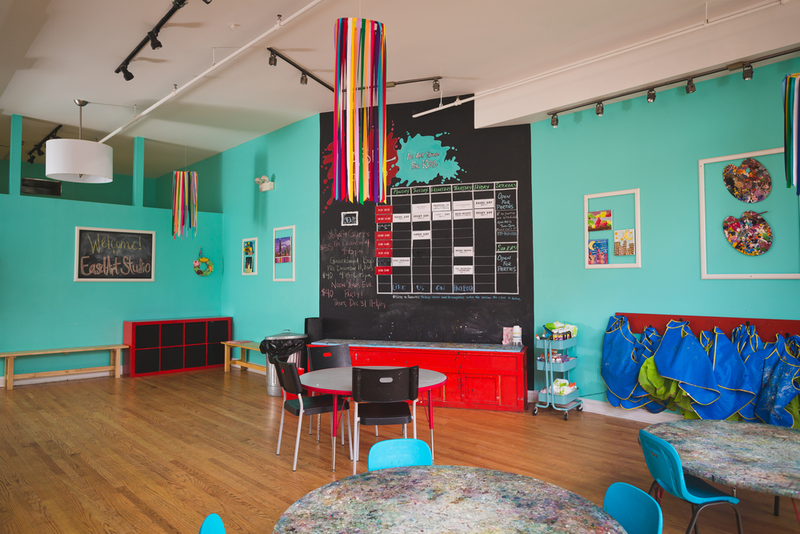 An Art Studio for Kids! Easel Art Studio is an art studio for kids! A place where kids can learn and be educated on the history of art & artists, be encouraged to be creative & curious, and most importantly, have fun! Here at Easel Art Studio, we strive to use the many elements that we find in our everyday surroundings, and let the child’s curious mind use those elements to make his/her masterpiece. We pride ourselves on encouraging kids that it's the process that matters most and not the final product, as every work of art is truly a masterpiece! Come get messy and join the fun! Register for a class session or drop-in in a class for a day! Don't forget to register for Easel's Summer Camp! Best part, you pick your days! We have some new and exciting Easel events coming up! Don't forget to check them out. "My husband and I took a family vacation with 2 kids (ages 5 & 7) to Chicago to visit some close friends for a week. Easel graciously took our last minute arrangements. The kids enjoyed visits to the park as a class and exploring crafts and art work. They were great with my kids. We look forward to reaching out to Easel camp again this next year!" "What a fantastic spot in the neighborhood! my daughter loves art classes here. Miss Kerry has great projects for kids of all ages, uses many recycled items, and even hosted an art show for the kids to display their art! If you are enrolled in a class you are also invited to participate in the 'Open Art' free time. Highly recommend Easel Art Studio!" "Kerry and her staff are so attentive, creative teachers. More patient than most people I know they make messy art projects super fun and stress free. Easels birthday parties are the best around, having been to quite a few. They make it so fun for the kids with several different art projects! It's worth it and I'm glad we have easel in our neighborhood!" "My son loves Easel Summer Camp- and so do I! Not only are the teachers awesome and the art work decorates our house, but the special field trips make the camp stand out. From pottery to yoga, the camp introduces the children to so many exciting things in the neighborhood." "If you are looking for a creative activity for your child, in a warm and caring environment, you should stop in to visit. Kerry, who runs the studio, is talented artistically and also wonderful with kids. It is amazing the different activities she plans. We have a room full of beautiful art pieces. Thanks Easel Art!!"